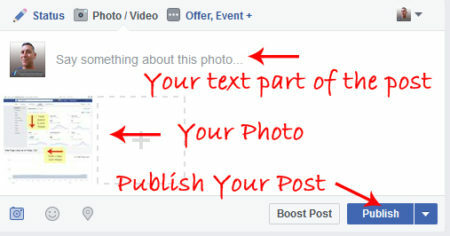 This one simple thing when creating Facebook Page posts can increase your reach. Using photos on your Facebook page WILL help increase your page reach if you do them consistently. Bold statement…. But it is true…. And you can do it too! I used a series of posts that had relevant photos to increase my reach to 1,065 over the space of a week. I used 3 posts that had photos to see if just posting those would increase my reach. As you can see on the right it gave my page a huge amount of organic reach. This is on a page that only has 322 likes so that is a ratio of 3 people reached for every 1 page like. Not a bad return in my opinion. You see, Facebook uses an algorithm for showing your posts to people depending on what type of posts they are. Posts with photos are considered much more relevant than text only, shared or link posts. So using photos in your own Facebook page posts will make a difference. The main thing to make sure of is that you use photos that are relevant to your audience and be consistent in posting them. Watch your engagement numbers on any photos you post and if they are constant then you know you are posting the right ones. How You Create A Photo Post. Select Photo / Video for your status update. 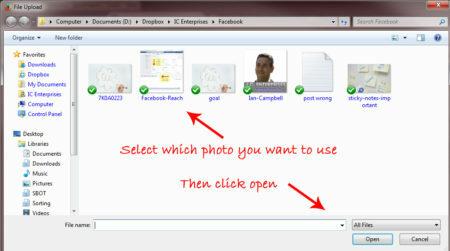 Select which photo you want to use and then click open. Once your photo is uploaded, write a relevant description or content in the text area and then click Publish. 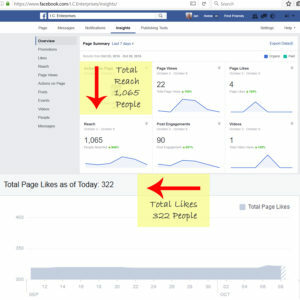 It is really that simple to start using photos on your Facebook page to increase your reach and to help others visually. 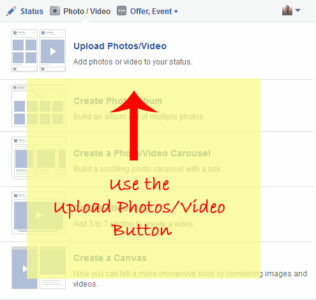 Some extra tips for using photos on your Facebook page. Inspirational photos – photos with a saying or quote that motivates and inspires your audience. Before and after photos – if you have a product or service, before and after photos show your viewers what changes using your product or service can make. Lifestyle photos – used sparingly these can help humanize you to your fans. Infographics – visually taking someone through a system or process can educate your followers and encourage them to like, comment or share your infographic with others. Cat/dog photos – unless you are targeting pet owners, this type of photo can appear unprofessional on your business page. Political images – people have strong opinions on their own political views and though you may have support from some followers, most will not appreciate this. Bad taste photos – basically anything that is in bad taste, be it racist, sexist, demeaning towards people….. just don’t do it. Inappropriate photos – you know the ones – if you wouldn’t show it to your mum, why post it on your page. Try to post a photo once a day to begin with. It may take a little while for the effects to filter through but if you start getting likes, comments and shares without getting a lot of un-likes then you are on the right pathway. Just keep your eye on the numbers and they will guide you on the best schedule for posting. When posting photo updates, share them on your normal Facebook profile feed FROM YOUR PAGE so you get even more reach when family and friends like or comment on them. Want to get more tips and tricks on using Facebook to help your business be seen better? Like and follow the I.C. Enterprises Facebook page. Great information. Thanks for sharing with us. Do you think automatically posting my instagram photo to my FB page will work the same as manual posting? Ok. I’m going to give it a try and see what happens! I usually upload photos from links more often then uploading them directly. Wow? great tips and your illustrative pictures compliment it well. I always find that the post I have with photos have more organic reach than the posts that does not contain pictures. I dont usually share my photo updates on my personal facebook page, but I am start doing it now. Thanks for the FB tip Ian. I know I really need to work on my consistency with photos! !